Lake Terrace is situated in Jumeirah Lakes Towers, opposite Dubai Marina and next to the Emirates Golf Club. The impressive residential building was designed by award-winning architects, WS Atkins, responsible for the famous Burj Al Arab hotel. The 40-storey building offers a choice of luxurious studios and duplexes along with one, two and three bedroom apartments overlooking picturesque man-made lakes. 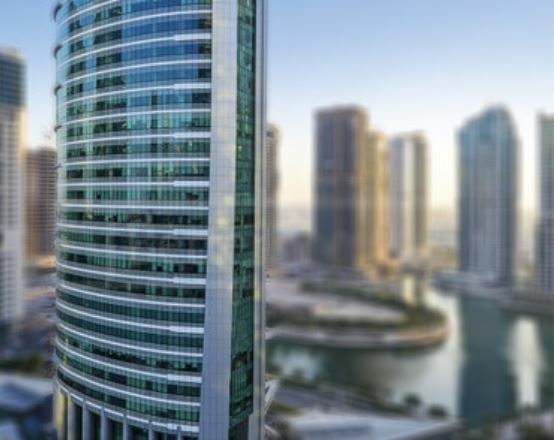 Situated in the heart of ‘New Dubai’ on Sheikh Zayed Road, Jumeirah Lakes Towers (JLT) is a lively community of statuesque towers, incorporating residential, hospitality and commercial property, in a Free Zone business environment. A true community, there are regular events in the picturesque common areas and the vast array of shops and services on offer mean residents have just about everything they need within walking distance of their home. Large lakes meander throughout JLT to create a beautiful waterfront lifestyle for residents and guests alike, with cafés, restaurants, shops and play areas. A circular road network allows great access straight off Sheikh Zayed Road and the community is served by two Dubai Metro stations – one at either end of the development.